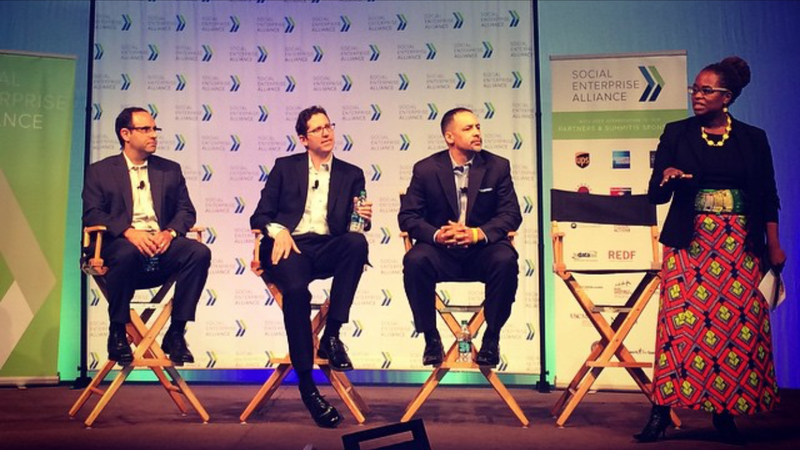 Last week, I had the opportunity to attend and participate in the 2015 Social Enterprise Alliance (SEA) Summit in Denver, Colorado. The Summit brought together over 400 individuals working in and with social enterprises for three days to network, learn from each other, and create a framework for the work of SEA and social enterprises into the next year and beyond. For those not familiar with the concept of social enterprise organizations, you are not alone. One of the topics of the opening session was on definition and scope. How do you define social enterprises? Who defines what a social enterprise is? And how do social enterprises continue to be relevant and a force for real change? What was particularly interesting to learn was how much social enterprise as an organizational category has grown in just the last two decades. Chuck Lief, the first president of the Greyston Foundation, a leading social enterprise since 1982, noted that it was less than 20 years ago that social enterprise organizations came together in Colorado for the first time to network and formalize as a sector. Now these double and triple bottom line organizations are increasing in number and impact every day and pushing the boundaries at the local, state, and federal level of what it means to be an organization driving a social mission. I had the opportunity to speak on a panel at the Summit on cross-sector collaboration, which has been a critical element for solving social challenges and a defining pillar of America Forward and New Profit’s approach. The concept is further increasing in popularity and complexity with the recent introduction of Pay for Success arrangements and the general rise in conscious consumerism and businesses’ response to those interests. My panel featured Kriss Deiglmeier of Tides, Richard Eidlin of the American Sustainable Business Council, Wendy Gonzalez from Samasource, and Cary Kennedy, Deputy Mayor of the City and County of Denver. Our session focused on how social enterprises could and should join forces with private and public entities alike to increase their impact. We had a candid conversation about the reality of collaboration, potential pitfalls, and resources needed in order to substantively engage and execute on collaborations, including Pay for Success projects. The overflowing capacity of the room highlighted the interest social enterprise organizations have in collaboration and Pay for Success. The engaging and thoughtful questions showcased the active and innovative thinking these organizations and their leaders are doing every day to advance their work and increase the impact they are having in communities across the country. On the second day of the Summit, Tulaine Montgomery, Managing Partner at New Profit, moderated an energizing plenary session entitled: Changing America: The Role of Social Enterprise in Creating Opportunity for All. The discussion included a robust panel of social enterprise leaders and thought leaders on social entrepreneurship and opportunity. The interactive session lifted up important questions on inequality, race, and the role that social enterprises should play in moving our systems from inequality to one of opportunity and equality. It was an energizing and educational few days as a variety of opportunities were available for attendees at the Summit to learn about the breadth and depth of the great work that social enterprises are doing all over the country. America Forward is proud to have a number of social enterprises as a part of our Coalition, including the Social Enterprise Alliance. Our policy platforms reflect the need for important federal policy changes to support and scale these organizations and we look forward to working with SEA and the social enterprise community to advance on these important changes to ensure they can achieve their double and triple bottom line outcomes.